Blizzard often thinks of implementing player housing in World of Warcraft, but might never get around to it. With around 12 million players per month, World of Warcraft is one of the most successful MMOs in the world. However, it lacks an often requested feature found in less popular games: player housing. World of Warcraft producer J. Allen Brack recently told Eurogamer that while Blizzard has been thinking about player housing, the studio can't figure out a way to logically implement it. "Player housing has been on the list of something we wanted to do even back before the original [game] shipped - it was a feature that didn't make that," Brack said. "It's one of those things we talk about every expansion - what would this look like in WoW?" Player housing refers to a personal space that players can typically customize to their liking. Decorations are often found in the game world or purchased through in-game currency. 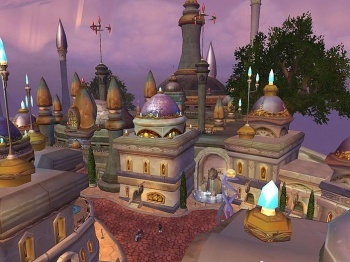 Brack said that the feature will never see the light of day in World of Warcraft until there's a reason for players to have houses, beyond just players having houses. "I don't think it's sufficient enough for us in WoW to just say: 'Hey we have player housing - great,'" he added. "There's got to be some reason to have that, there's got to be gameplay behind that, stuff that happens." Though player housing has been nixed with the release of each World of Warcraft expansion, Brack doesn't totally rule it out for expansion #4. Blizzard will just have to figure out a way to make houses matter, perhaps by making players fight over them in PvP or through introducing a quest chain where building a house helps take down an Old God.